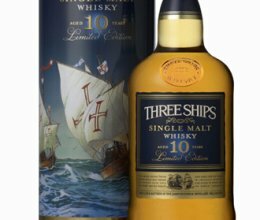 The limited edition Three Ships 10-year old single malt recently returned home with a gold medal from the Concours Mondial de Bruxelles held in Luxembourg. A total 7 386 wines and spirits from 49 producer countries competed before a hand-picked selection of some of the world�s foremost judges. The whisky was matured for the full 10 years in American oak casks of varying ages with the older small wood contributing to the exceptional smoothness of this whisky while also imparting a slight sweetness.� It�s a full-bodied and well-rounded whisky with a hint of peat and estery notes that add a slightly sweet fragrance hinting of dried fruit and fudge. With only 8 000 bottles launched in October last year, it is highly unlikely that you would still find a bottle in liquor outlets but if you are lucky enough to spot one, make sure it becomes part of your whisky collection. The Three Ships range of whiskies is produced by master distiller Andy Watts at The James Sedgwick Distillery, situated in Wellington under the shadow of the Cape�s Drakenstein Mountains. The distillery was established in 1886 and over the past two decades has undergone several upgrades transforming it into a state-of-the-art distillery. The Three Ships fleet consists of Three Ships Select, Three Ships 5-year-old Premium Select, Three Ships Bourbon Cask Finish and now the Three Ships 10-year-old Single Malt Whisky.